WASHINGTON — On Sunday, after the Washington Post reported Christine Blasey Ford’s accusations against Supreme Court nominee Brett Kavanaugh, Republicans were divided. Sens. Bob Corker, R-Tenn., Jeff Flake, R-Ariz., Susan Collins, R-Maine and Lisa Murkowski, R-Alaska, called to delay Kavanaugh’s confirmation and hear from Ford. 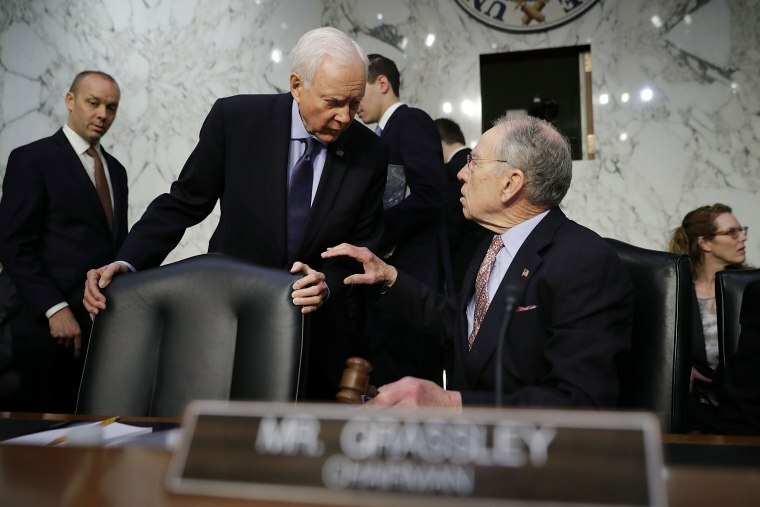 But after Ford’s attorneys wrote to Senate Judiciary Committee Chairman Chuck Grassley, R-Iowa, that Monday’s scheduled hearing was too soon (“The hearing was scheduled for six short days from today and would include interrogation by Senators who appear to have made up their minds that she is ‘mistaken’ and ‘mixed up’”) and that an FBI investigation should occur before she testifies, Republicans are much more unified. Testify on Monday, they say, or they’ll move ahead with a vote on Kavanaugh. “After learning of the allegation, Chairman @ChuckGrassley took immediate action to ensure both Dr. Ford and Judge Kavanaugh have the opportunity to be heard, in public or private. Republicans extended a hand in good faith. If we don’t hear from both sides on Monday, let’s vote,” Corker tweeted, per NBC’s Frank Thorp. So Republicans are a lot more unified on Wednesday morning than they were 48 hours ago, although we haven’t heard directly yet from either Collins or Murkowski since Ford’s attorneys sent that letter. And the Washington Post recounts how Ford’s life has been upended after her accusation. “At 10:28 Tuesday morning, a Twitter account with a white ­nationalist talking point for its handle posted Christine Blasey Ford’s personal address... Ford has received a flood of supportive messages since The Post reported her identity Sunday, according to a person close to her, who spoke on the condition of anonymity to discuss a sensitive matter. But she has also faced a stream of harassing messages and threats. 'No one believes you,' one message said. 'Karma is a [expletive] and it will be visiting you very very soon.'" Twice yesterday, President Trump said that the FBI shouldn’t be involved in investigating the accusations against Kavanaugh. “I don’t think the FBI really should be involved because they don’t want to be involved. If they wanted to be, I would certainly do that. But as you know, they say this is not really their thing,” he said before his bilateral meeting with Poland’s president. And in his news conference later in the day, Trump added, "The FBI ... said that they really don’t do that; that’s not what they do." But according to NBC’s Pete Williams, it is UP TO THE WHITE HOUSE to ask the FBI to look into these matters. “The Senate cannot ask the FBI to investigate the Ford letter, because Kavanaugh is the president's nominee, not the Senate's,” Williams adds. What if Keith Ellison, not Tom Perez, won the race for DNC chair? So Democrats have the ad-spending advantage in 12 districts, Republicans lead in nine, and four have no spending for the general election so far.